Work in greater comfort, with this portable phone and tablet stand. It holds your mobile device, so you don’t have to. You can position your smartphone or tablet at the ideal viewing angle and browse the web, review documents or make calls, with ease. 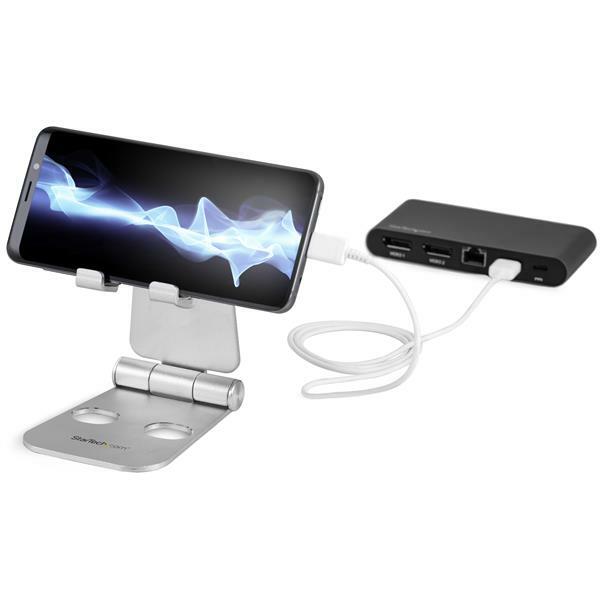 Made of durable aluminum, the universal phone and tablet holder provides a stable platform for multiple mobile devices, including most smartphones and 4” to 13” tablets (maximum 11 mm depth) such as the iPad Pro and Samsung™ Galaxy™ tablet. In brushed aluminum, it makes the perfect iPad or iPhone stand. With this highly adjustable multi-device stand, you can type and swipe without having to hold your tablet or phone in your hand or set it down on your desk. Simply move the smartphone and tablet holder up or down for comfortable viewing. 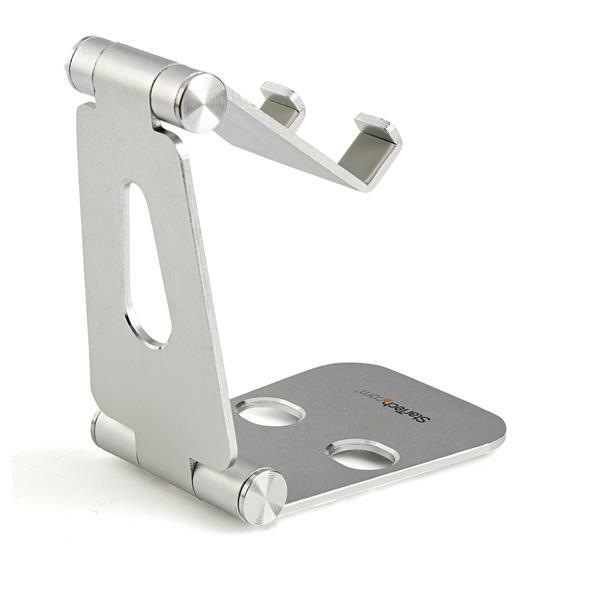 The multi-angle tablet stand moves smoothly, so you can adjust your viewing angle with your device still in the stand. The stand supports both landscape and portrait orientation. Compact and lightweight, the foldable tablet and cellphone stand is perfect for mobile use or travel. It folds up into a flat form, so you can easily tuck it into your bag. The stand stays in place on a wide range of surfaces, with four non-slip silicone feet on the bottom surface. The USPTLSTND is backed by a StarTech.com 2-year warranty and free lifetime technical support.